Caller ID Spoofing, Featured Apps, More! 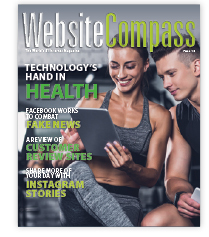 Technology's hand in health is the topic of the feature article in the Fall 2018 Website Compass magazine. From exercise apps that get you moving to food gadgets that evaluate nutrition, you'll get a healthy dose of information in these pages. Also in this issue, you'll learn how Facebook is working to combat fake news and how impersonators use emergency scams to steal money. Website Compass is a value-added bonus for being one of our internet customers. You can access it at this link. 3 Rivers customers have been contacting us regarding phone calls that appear to be coming from a local number but in fact are scams. One of the best ways to avoid phone scams has always been to not answer calls from numbers you don't recognize on Caller ID. But the bad guys have found a way around this. With Caller ID spoofing, they make it appear as if their calls are coming from a local phone number. They hide behind the "mask" of a legitimate phone number in order to increase the likelihood that you'll answer. How does it work? Caller ID spoofing providers allow individuals and organizations to dictate what phone number they want to appear when they place calls. They pay for a certain number of call minutes, then use an online interface to enter their phone number, the number to be called, and the number they want to appear in the recipients Caller ID and the call is made by the provider. Never give out personal information such as account numbers over the phone unless YOU initiate the call. If you receive a call requesting information like this, ask the name of the organization that's calling. If it is a company you regularly deal with, find their number on your bill or statement — not the number on your Caller ID — and call them. If the call is legitimate, you will be transferred to the appropriate department. If it's not legitimate, you can inform the organization of the spoofing incident. To learn more or file a complaint about Caller ID spoofing, visit www.fcc.gov/guides/caller-id-and-spoofing. usa.gov – Make sure you're prepared to vote in this November's midterm elections! Visit this site to register to vote, change your registration, or get more information about state or local elections. New to voting? No worries — you'll also find common voting terms and a primer on how to vote. countryliving.com – If you love fall, you'll love this site. It includes the best inns and B&Bs; to check out fall colors, dozens of easy tailgating recipes, fall decorating tips and wedding ideas, fun Halloween costumes for every age, and updates on your favorite TV shows returning this fall. cleaninginstitute.org – Fall is a great time to deep-clean your home, considering it's the start of that season when germs really start to spread. This site offers tips for getting your house cold-and-flu-ready and sparkling fresh. Check out the End of Summer Clean-Up and Fall Cleaning sections for specific ideas. edmunds.com – There's a special feeling when you buy a car so new it's named for the following year. Whether you're in the market for a vehicle fresh off the production line or one that's been around the block, this site provides for-sale listings and "fair/good/great deal" alerts for your area. Short Tutorial/FAQ – How Do I Make Sure I See Facebook Posts From The People I Want?